- The Tree of Life offers a meditation on the balance and harmony of all living things, and reflects the vast and fragile web of life. Our meditation banners are beautiful and silky-soft, printed in full vivid color on sheer, flowing knit polyester. They look like silk, but are durable and long-lasting, and they are great for indoor or outdoor use. They have a decorative wooden pole at the top and bottom, and a string for easy hanging. Banner measures 15" by 15". 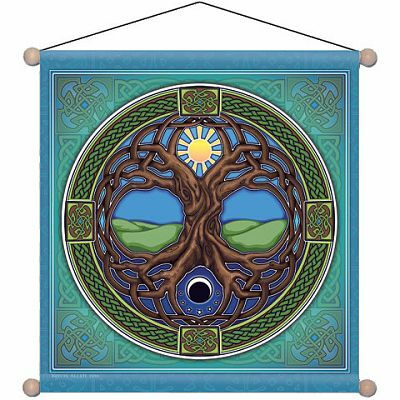 Do you have any other questions about our Tree of Life Meditation Banner?